There is a lot of ESL supermarket vocabulary on this page for you to learn and use when you need to go shopping. Everyone needs to go shopping, and it is often most convenient to go shopping at a supermarket, so you will need to know words and vocabulary about using a supermarket. This page has two parts. The first part is about learning the vocabulary and the second part is about testing your knowledge of the vocabulary. 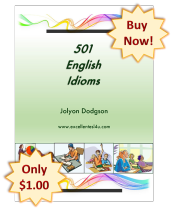 The page starts with the ESL supermarket vocabulary list. This has lots of useful words with definitions. You can either use this list now to learn the words or in the future as a reference source when you find a word you do not know, and you can look it up. 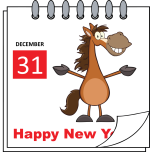 There are also flashcards of the vocabulary for you to download and a recording of the vocabulary being spoken by a native English speaker so you can hear the pronunciation. Selecting a definition that goes with a word. Selecting a word that goes with a definition. Selecting a word that matches a picture. This part of the page has the ESL supermarket vocabulary list with definitions. You will need to know all of these words if you are going to be able to understand shopping in a supermarket. After the word list there are flashcards that you can download and then a recording of the vocabulary being spoken and pronounced correctly. 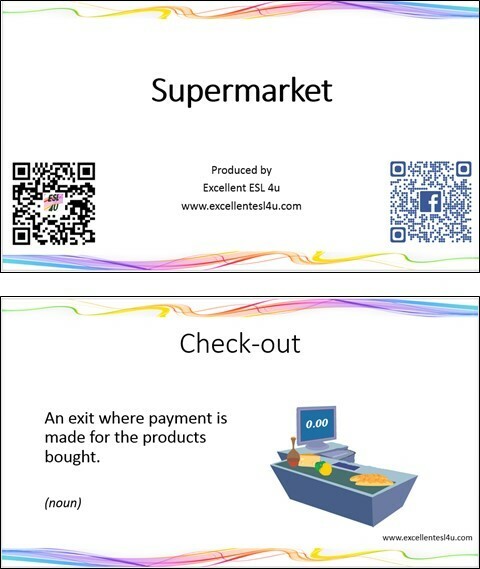 You can download and use the following ESL supermarket vocabulary flashcards by either clicking on the picture or the link. You can then use them when you are not able to connect to the Internet. This part has two recordings of the ESL supermarket vocabulary being spoken by a native English speaker. You can listen to the recordings as much as you need to so you can learn the correct pronunciation. For the first recording you can just listen to it, while for the second one you can watch a video of the flashcards while listening to the words. For this first ESL supermarket vocabulary activity you need to decide which option (A-D) in each question is the definition that matches the given word. After you have answered all the questions you can use the get score button to see how well you did. Choose the correct definition for the supermarket vocabulary in this quiz. 1) What is the definition of Basket? A) Intoxicating liquids that people consume. B) The meat from cows. C) A container for holding goods. D) An area for leaving cars and other vehicles. 2) What is the definition of Carrier bag? A) A transparent wrapping sheet for covering food. B) The products made especially for cats to eat. C) Items to cover the body. D) A plastic container used to carry shopping home. 3) What is the definition of Dried spices? A) Plants that enhance the flavour of food. B) A sweet made from the cocoa bean. D) A warm bed covering. 4) What is the definition of Freezers? A) A sour citrus fruit. B) Large display areas that keep food below 0oC. C) A green plant that has its leaves used in salads. D) The cooked meat of pigs. 5) What is the definition of Shelf stacker? A) The means of paying to send a letter to someone. B) A person who places the products on to the shelves of the supermarket so customers can buy them. D) A liquid made from vegetables that is eaten. In the next ESL supermarket vocabulary exercise you need to decide which of the words in the options (A-D) in each question matches the definition given. Again you can click the get score button to see how you did. 1) What is the meaning of the following definition: The edible parts of plants that people eat? 2) What is the meaning of the following definition: A type of fuel for cars (UK English, same as gas)? 3) What is the meaning of the following definition: A container for boiling water? 4) What is the meaning of the following definition: A way out? 5) What is the meaning of the following definition: The person who works at a check-out and takes the money (same as check-out operator)? 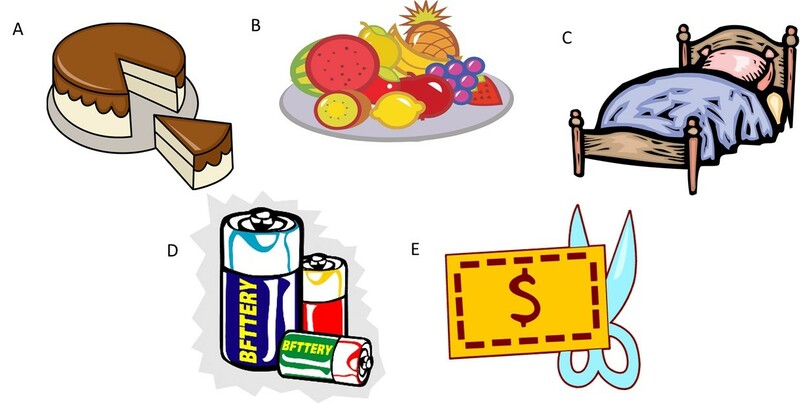 For the final ESL supermarket vocabulary task you need to look at the following pictures and then decide which option (A-D) in each question has the word that matches the picture. Then you can see the correct answers by using the get score button.